Familiar and original words combine with two well-known melodies creating a refreshing and lovely work for Christmas and winter. With ease and grace, this choral is a musical setting worthy of any December performance for mixed voices as well as men's and women's ensembles. Beginning with a slow and quiet vocal intro, this favorite spiritual increases in tempo with a hushed energy and builds in sound with each subsequent verse. Creative choral writing fills the piece with harmonies and interesting melodic lines between vocal parts. A standout for your women's choir performance! The Christmas story is told in a gentle lullaby for SSA voices. Unison, 2-part and 3-part harmonies weave throughout and delicately paint the text while calmly teaching the singer nuance and quiet singing. Available separately: SSA, PianoTrax CD. Duration: ca. 2:26. Lights are twinklin' and bells are jinglin'; there's a happy feeling in the air. This easy swing-original, It's Christmas and All of That Jazz, will light up your concert. Jazz harmonies and smooth voice-leading bounce through this bright choral. The multiple voicings make it suitable for every age level. Something for all ages! This novel little swing number is a cool selection to add humor and spirit to your holiday or winter concert. The upbeat song laments the return of Jack Frost and cold weather and pleads for him to get lost. A lesser known gem from the American songbook. This bouncy number has been a popular selection and now has been released in new separate 2-part and 3-part voicings and a brand new SSA voicing as well! Set the holiday mood with these adorable lyrics and swingin' style. Here's an exciting and upbeat a cappella version of the traditional spiritual combined with Beethoven's ever-popular tune from the ÚNinth SymphonyÚ. New seasonal lyrics for the Beethoven will be perfect for any winter concert! From the MGM film In the Good Old Summertime comes this song sung by the great Judy Garland as a moving ballad. O'Connell has given this arrangement a casual swing, making it appealing to many ages and perfect for brightening any holiday program. Rhythm parts and track available. Looking for a romantic setting or perhaps a piece remembering loved ones far away? Mariah Carey's seasonal hit is a contemporary selection with a classic feel. The melancholy take of being alone at Christmas and missing loved ones will warm the hearts of those who sing and hear this special song. A Christmas nod to Mister Sandman, this Pat Ballard song is a must for the holidays. Perfect for either your 2-part choir or women's ensemble. Complete with bum bum bums, this letter to Santa is sure to entice your listeners - even Scrooge! Available: SSA; 2-Part; StudioTrax CD. Nanita Lullaby is a simply stunning arrangement by Earlene Rentz of the familiar Spanish carol, where Nanita quietly sings as she rocks a baby to sleep. The slower tempo creates a quiet mood and allows the singers to achieve success with the Spanish language as well as with the harmonic and dynamic writing. Chord symbols are provided with the suggestion for a guitar accompaniment with or without the piano. This original gospel work is filled with musical energy and sound. 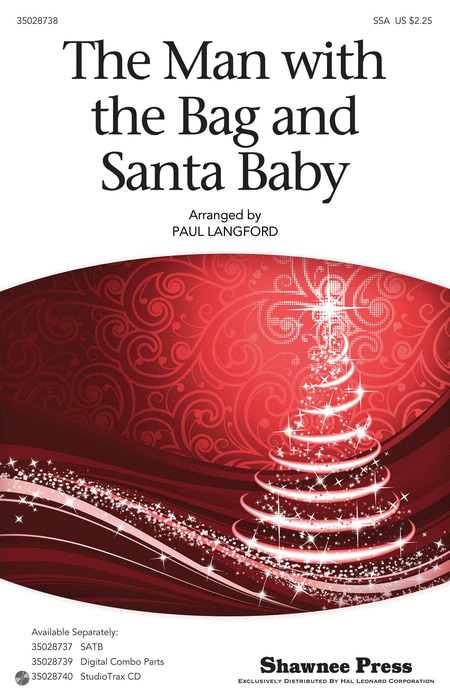 Whether you use the piano accompaniment alone, add the instruments, or use the hot track, this will surely bring down the house for your Christmas or holiday program. Put some Elvis into your concert with this hit from 1957. Complete with combo parts (alto sax, bass, drums, guitar, trombone, trumpet) and voiced for mixed, women and male choirs, this arrangement rocks the stage and makes a great novelty number with movement, costumes and staging, too. Mark Hayes has imagined a delightfully new arrangement for this holiday classic. In a bright shuffle feel, the song has bounce and syncopated rhythms not usually heard. The piece is just perfect for all ages and has a fantastic orchestral track available as well as instrumentation. Two Czech and Austrian carols are showcased here. Simple and gentle elegance flows throughout this work for young voices as well as women. The original text using The Rocking Carol beautifully introduces the snow theme of Still, Still, Still and highlights the quality of quiet and thoughtful singing. This jazzy Christmas standard has been recorded by such artists as Ella Fitzerald, Nancy Wilson, and SheDaisy, just to name a few! With a gentle swing feel, romantic lyrics, and rich, accessible vocal harmonies, choirs of all kinds will love performing this arrangement. It's especially nice for the ladies! A classic by Mel Torme and a signature song for Nat King Cole, this is simply one of the most famous and favorite Christmas songs of all time! The lush orchestration wraps every gorgeous voicing in a beautiful musical package to be opened at your next holiday or Christmas concert. Trotta's fine vocal writing sets a text adapted from Stein's poem into a picture postcard of winter beauty. The piano is rhythmic with forward motion under interesting vocals lines that paint each phrase. There were frosted-painted people, and a frosted church and steeple and a frosted bridge and river tumbling over frosted rocks. A superb selection for women's voices and treble choirs. These two holiday favorites are a perfect match! Add some swing to your performance with Kris Kringle and sing about that luxury gift list as well. This selection is pure fun with fantastic jazz arranging for mixed choirs and will be a blast for your women too! 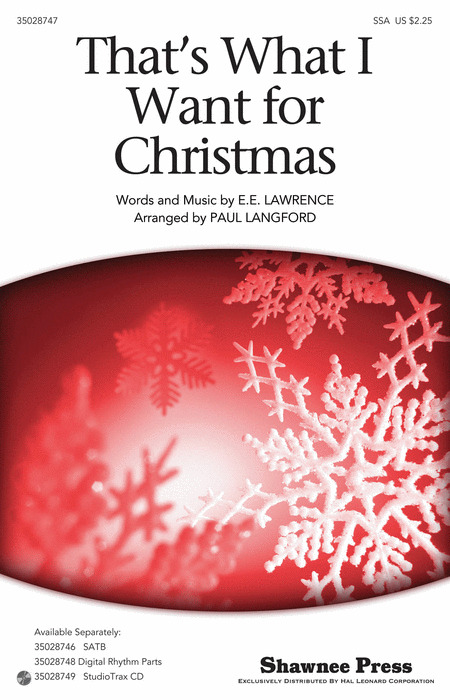 Originating from Jerry Herman's Broadway musical ÚMameÚ, the popular Christmas song is thrilling in this newly orchestrated choral work. Children to adults will love this holiday gem, which is available in multiple vocings, including for men's and women's choirs. A mystic and silver-colored December twilight is described in this gorgeous concert work for women. Filled with warm three-part writing, painting the chill and frost of the winter season.